In a recent poll, 67% of Foundry Fox readers would use card machines provided by a busker to donate. Soon you’ll be able to give money to buskers electronically across the whole of London, but will it make people more likely to give? London Mayor and progressive champion Sadiq Khan launched the project in a collaboration with Busk In London (a professional body for buskers) and iZettle, a Swedish payments firm, recently purchased by Paypal for £1.6 billion. London is considered an important hub of live music, winning the title of Live Music Capital of Europe in 2017 after hosting 19,940 concerts in 2016, and pumping nearly £1 billion into the economy. In this contactless cashless society buskers, charity collectors, the homeless, and big issue sellers are all set to make a loss, so could making portable card machines available be the solution? Many buskers in London seem to think so, fearing that busking could soon be a distant memory without modernisation. Full-time busker Charlotte Campbell insists that the preliminary success of the card machines mean that without the new technology, street performance risks becoming a ‘dying art’. ‘More people than ever tap to donate while I sing. If street performers like me don’t adapt to the cashless society, we risk becoming a dying art’ she said in an interview with the Big Issue. The London Underground is a hub of musical activity with buskers on the tube having the unique opportunity to have their music heard by 3.5 million listeners every day. Licensed buskers can perform on sponsored stages on the underground in an ongoing initiative set up by Transport for London (TFL), with previous sponsors including Carling, Capital FM, and Coca-Cola. According to TFL, the sponsored stages have attracted international media interest, with buskers booked for events and recording sessions off the back of their underground performances. Ed Sheeran and Passenger have even graced the streets of London. Londoners are a hard group to persuade to part with their hard-earned cash, with travel, alcohol, and house prices some of the highest in the world. But anyone who knows London knows that music is an integral part of the city, and it’s likely that if you could donate £2 to a talented street musician using a contactless card, you would. 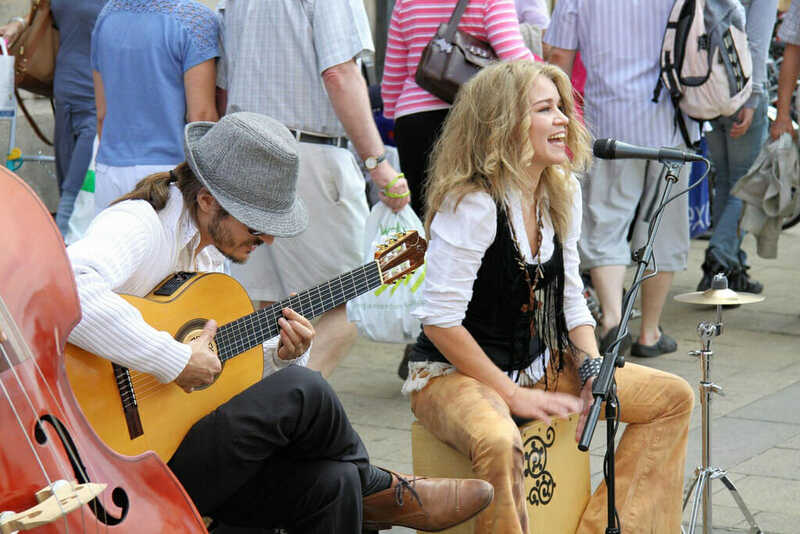 Londoner’s may work hard for their money, but they also know that quirks like busking help to make London one of the most culturally vibrant and diverse hubs of the world and are happy to support it. With the amount of raw talent about busking is a great way to get your music out there, and make someones commute a bit less grim. If you’re a budding musician and want to try busking check out TFL to see how to start. Criticisms of the scheme are not many but they do include certain security fears. Many of us are happy to electronically transfer our financial details to trusted retailers but less so to someone in the street. The scheme is still in the planning stages but presumably, the machines will need to be registered. Another criticism is that surely, the main demographic suffering in this cashless society are the homeless, with many arguing that they are more of a priority than buskers. It remains to be seen if this initiative will be extended to the homeless community in the future. Buskers wanting to use a machine will need to connect it to a smartphone or a tablet to take payments. There are no details yet on whether it will cost buskers to hire out the readers, or if there will be any fees or set donation amounts, most likely there will be an app. So fear not, the future of London streets is musical, go forth and support it! We spoke to London based singer-songwriter and licensed busker Imogen Harfleet for a professional opinion. How did you get into busking? I started busking in 2014 with Porter, an acapella trio I’m in. We auditioned with the Southbank Centre and got a license to busk along the South Bank. I was excited to busk with the girls and I think it is less intimidating busking with other people. But the first time I busked alone I was terrified! I had put myself next to a little market though, and the people there were really sweet and I felt much more comfortable. Someone even bought me a coffee…it’s the little things. Most of the time busking makes me feel great. 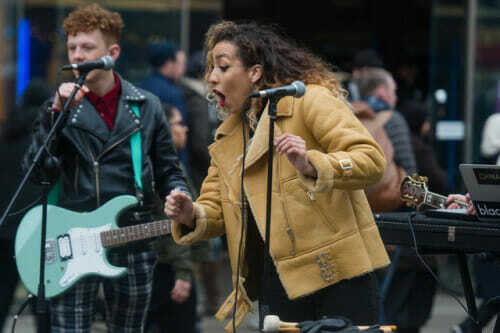 Once the fear of singing to a high street of unsuspecting people falls away it’s quite empowering. Have you noticed a decrease in the number of people donating? I have noticed a slight decrease in recent years yes. Is getting a license difficult? There is an annual audition process for buskers on the Southbank, on the underground and in places like Covent Garden. I personally think that’s the best way to get a license. You can also apply for different boroughs across London. How has the new cashless society affected your earnings? I’ve only busked for the past few years so I can’t compare to when people carried more cash but I think it must make a difference. It again depends on where you are busking though. For example, on the Southbank near Waterloo, there are lots of tourists who still tend to carry cash and also come to places like that for the street entertainment. On the other hand, I’ve busked in towns like Kingston and Guildford and can still earn just as much, and they are places where you would expect people to just be using card. Would you use a card machine? I had never thought of using one before, but I would be intrigued to see how it could affect a day’s earnings. Do you feel supported by London? From my personal experience in London, I feel that buskers are supported by Londoners and this new scheme shows that we have the support of Sadiq Khan too. The Southbank Center are really supportive of their network of buskers and there are rules in place to keep things fair and safe. Do you think people would miss buskers if they disappeared? Most people probably don’t think too much about the buskers they see all the time on their commute to and from work, but I feel like they would notice if we weren’t there, so to have something new in place with the hope to keep us in London is really interesting. You’re putting yourself in a difficult situation when busking alone, especially as a woman, but I’ve only had a couple of occasions where men have come to chat to me (not really about music) and hang around a little too long. Normally I just keep singing and they eventually get bored and go on their way. I did have a man come up to me once who stood there for a little while, then he just said ‘thank you’ and started to take money out of my box. He took about £5 or £10 and I was so taken aback by the boldness of it. I was in the middle of a song and just kept singing. I didn’t feel like I could have stopped him and he obviously felt he needed the money more than I did.